Anyone who grew up in Britain in the seventies or eighties will remember Sunday night TV for one thing: James Herriot driving his Austin 7 through the Yorkshire Dales to the sounds of a soaring, tinkling piano soundtrack. All Creatures Great and Small had a huge effect on me as a child and inspired two ambitions: one, to become a vet and two, to play the piano. The first ambition was swiftly crushed come GCSE time when half of my teachers ganged up to inform me that I was hopeless at science and should do something arty-farty instead. The second was more fruitful and I taught myself to play the entire theme tune from scratch. It remains the only piano piece I have ever played (aside from Beverley Craven’s ‘Promise Me’, but let’s draw a veil over that). Swaledale is a hard, pasteurised cheese made by The Swaledale Cheese Company in Richmond, North Yorkshire. It can be made with cow, sheep or goat milk, which got me rather flummoxed when I got home and realised I didn’t see which one I’d bought (an amateur case of livestock confusion which James Herriot would not have made). Its buttercup glow and the fact that their ewe’s milk cheese is seasonal got me guessing cow but I popped back to the shop under cover of croissant-buying just to make sure. Cow it was. A cheese cousin of Wensleydale and Cotherstone, the roots of such cheeses stretch back to the French monks who settled in the Yorkshire Dales following the Norman Conquest. Most cheese in England at the time was still made with ewe’s milk, which suited the monks just fine, although they were used to a more Roquefort-esque fromage. As a result, the first Dales cheeses were thought to have been blue. The monks passed on their cheese-making knowledge to local farmers who continued to make it after the Dissolution of the Monasteries, mainly as a subsistence cheese. Cow’s milk replaced ewe’s during the seventeenth century and the blueing petered out. The advent of creameries (in essence ‘cheese factories’), coupled with two world wars sounded the death knell for farmhouse Dales cheese; production declined throughout the twentieth century so that by 1980, a Mr and Mrs Longstaff were the last producers of traditional Swaledale, using a secret family recipe. Mr Longstaff passed away and Mrs Longstaff decided to retire. She passed on her recipe to David and Mandy Reed and helped them to develop an authentic Swaledale cheese. The business was a great success and they now produce 1.75 tonnes of cheese a week and the Swaledale recipe and methods are accredited with Protected Designation of Origin (PDO) status. Sadly, David and Mandy have both now passed away but their twenty-something children Sam and Louise have taken the helm with gusto and continue to drive the business forward. 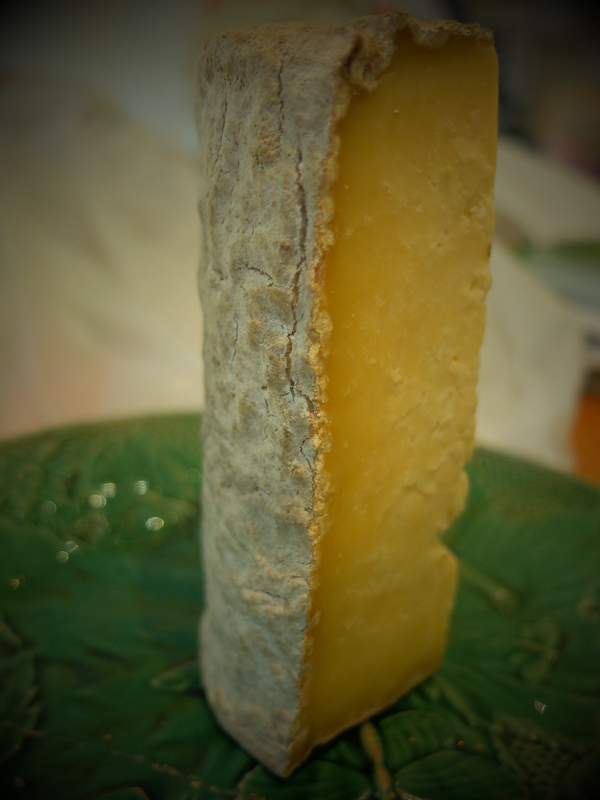 The cheese is matured for just four to six weeks usually. It’s a highly territorial cheese; the livestock graze the traditional hay meadows on the slopes of the Dales; they come alive with flowers in spring and summer, which is said to impart a unique flavour to the cheese. I sometimes have quite tarty tastes when it comes to cheese, erring on the side of tastebud-assaulting blues and tangy Cheddars. But I’m learning to appreciate more subtle cheeses and this one was lovely. Buttery and moist in texture, it tasted like a cowshed smells to me and I mean this in a good way – of warmth and hay and the promise of milk. It’s a tiny bit tangy too. I like to imagine Tristan Farnon eating it in his ploughman’s lunch at the Drover’s Arms with a pint or two of Best Yorkshire Bitter. But you really don’t need to know about my childhood crush on Peter Davison. Very interesting. Thanks for teaching me about cheeses, some of which are new to me. A visit to the cheese shop is in order. Sounds like a great idea 🙂 Enjoy your trip and let me know what you choose. Well, I did not pick up a cheese. Instead, I picked up some (very large) brie stuffed dates coated in slivered almonds. They were wonderful! Ew! Peter Davison – possibly the wettest Dr Who ever. Happily your taste in cheese is much more evolved 😀 This sounds lovely and it’s so heart-warming to hear of yet another traditional cheese saved from extinction. Haha, I like to think my taste in men has evolved since I was eight…but am loathe to offer up any examples for public ridicule 😉 I like the Dales cheeses; they’re all subtle but rather lovely. Memories,memories…all creatures great and small…and Promise Me! Don’t! You’ve got it into my head!!! Aw, they are very pretty, thanks! Yummy cheese. Beautiful Dales. But Peter Davison??…..Really?! I am with you on Tristan! James Herriot’s are some of my favourite books – every page can make you laugh and cry in equal measure. I travelled up to Yorkshire a couple of years ago and saw the house in Thirsk – it’s now a James Herriot museum and if you haven’t been, I recommend it. The cheese sounds lovely – I’ll definitely give it a try. I saw in a long time ago but I don’t think it was a museum back then. My Dad actually knew some of the characters in ‘real-life’ so we had a bit of a tour round when I was a child. I must go back though, I love the sound of a museum all about it.